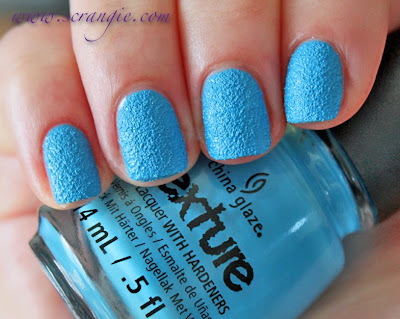 Here's China Glaze's entry into the textured polish arena. So far I've mostly worn glitter-based textured polish, but I gotta say, the texture really stands out on matte creme colors like these. I've grown to like the glittery kind, sure, but some of them just look like you forgot to put on topcoat. These are not like that. China Glaze Bump and Grind. Bright fuchsia-coral creme base with sandy texture. China Glaze In The Rough. Light yellow-toned green creme base with sandy texture. Reminds me of really cheap guacamole, the kind that's probably only 2% avocado. China Glaze Itty, Bitty and Gritty. Bright pink coral creme base with sandy texture. Medium sky blue creme base with sandy texture. Light yellow-toned orange creme base with sandy texture. Light pink creme base with sandy texture. The formula on these is gritty (obviously). There are two things to be mindful of when applying this formula: One, the grit can clump together, so you may need to brush over it a few times to get it evenly distributed across the nail. Two, if the base to grit ratio is wrong, some spots will look smooth and shiny instead of evenly textured. Thin, even coats are a must if you want a uniform look. Other than the grit (think of it like glitter), it applies like a normal polish. These are opaque in two coats (what I'm using here) and dry to a semi-matte finish. I gave each of these about 15 minutes to dry before photographing them and they all seem to retain a slight amount of gloss rather than drying to a true matte finish. If you're looking for something unique, unusual, and hell, even flat-out weird, this is it. The textured look is odd enough, but combined with the unexpected base colors (spring green??) in the collection they're just completely bizarre. I like bizarre. 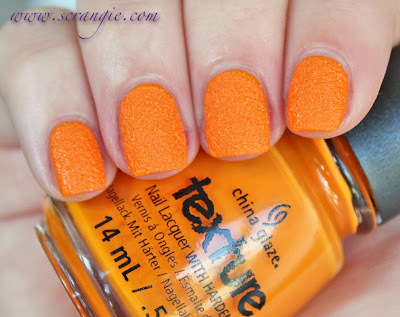 Toe-Tally Textured is my favorite here (I just really like orange), but if you want to go all out crazy... In The Rough. Such a strange polish. Ahahaha cheap guacamole. That was fantastic. I don't think I'm 100% sold on texture polish. There are some I like, but then In The Rough and Of Coarse! show up and I'm like I don't know about this guys... I would probably get Toe-Tally Textured, though. I, too, like the orangeness. Your nails always seem to rock just about anything! These are a pass for me, though... I am a bit of a sparkle whore and love the glitter texture polishes. Loved your itty bitty gritty committee comment and yes, that green does look like crappy store bought 25% avocado guacamole. "itty bitty gritty committee" LOL!! I know what you're referencing here, my family bought me one of those t-shirts when I was 12 or 13 and it scarred me for years, I still feel inadequate 25 years later! p.s. great swatches, as usual! I love all of these oh wow! I loooove texture polish and these colours look so incredibly fun and bright! I haven't been a big fan of this trend, but I do kind of like the orange and bright pink for summer. I do wish they'd done a bright grass green instead of/in addition to the cheap guac! I love the textured trend. Bump and Grind is one of my favorite textured polishes. So gorgeous! I kinda like the orange & blue but I still hate the look of the texture, it looks so......lumpy! I love all of these. They remind me of those 90's fuzzy sweaters. Just not a fan of matte textured polish that has no sparkle at all, looks too much like dried craft paint to me. I'm passing on these but love Zoya's Pixie Dusts, especially the new ones for fall. Hope it's OK to say that. i don't see nothing wrong with a little bump n grind.